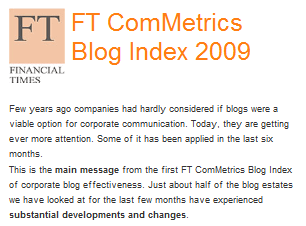 Trends are key with the FT ComMetrics Blog Index as the the FTindex results indicate. So we need to watch what they tell us, including the top 3 and top 10 as listed in the chart below. 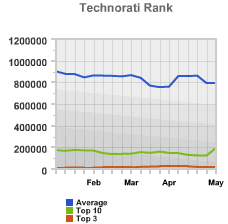 We use several ranking mechanisms are used to arrive at the ComMetrics Footprint, such as the Google PageRank, Technorati Ranking, Technorati Authority, Yahoo! InLinks – Backlinks and Google Blog Search. The figure to the right shows that the ComMetrics footprint index has been going up for the FT Global 500 and Fortune 500 firms whose corporate blogs are being tracked and included in the index. The chart measures the top 3 and top 10 group of those ranked in the FT ComMetrics Blog Index. The chart also indicates that after the slight drop in during January the overall index has stabilized and is moving in a pretty much straight line throughoug February and March 09. 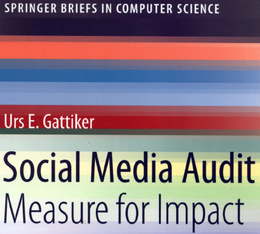 Financial Times June 2008 – by Urs E. Gattiker – is blogging good value? Tips and tricks for improving a blog’s ComMetrics Footprint, as well as the Google PageRank, Technorati Authority, Technorati Ranking, Yahoo! InLinks, Google BlogSearch.